Joanne started her musical studies in Chicago under the training of Leonard Chausow and Sam Sciacchitano and continued with Robert Sayre in San Francisco. 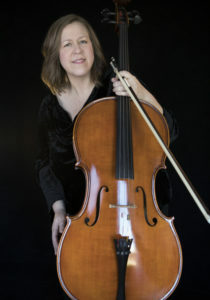 She has played with many professional and community orchestras throughout the Chicago, Detroit, and Sacramento areas, including the Chicago Civic Orchestra, Redwood Symphony, Camellia Symphony, Folsom Lake Symphony and Auburn Symphony. Joanne also performs with various small chamber ensembles as well as the Cary Farley Band in Sacramento. Joanne was also featured in Cary Farley’s most recent CD “Goodnight,” with a new CD currently in the works.